National Trust property Little Moreton Hall once again hosts a production by award-winning local amateur company, Alsager Community Theatre. In July, ACT stages an adaptation of The Two Noble Kinsmen, written jointly by William Shakespeare and John Fletcher, in the courtyard of this beautiful Elizabethan Hall (or in a marquee there if the weather is wet). This story of two young Theban knights in love with the same woman is a tale of war and courtly love previously told by Chaucer in The Canterbury Tales, and is based on an ancient Greek myth. There is conflict between the Greek cities of Athens and Thebes, and cousins Palamon and Arcite find themselves prisoners of war in Athens. Their prison cell overlooks the garden of Emilia, sister-in-law to the Duke of Athens, whereupon they both fall madly in love with her, changing from the best of friends into perfectenemies! 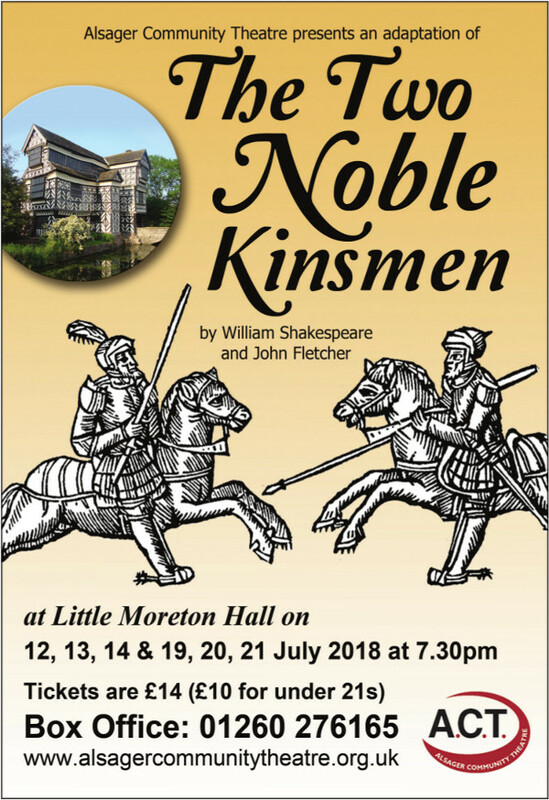 This play will be performed at Little Moreton Hall from the 12th – 14th and 19th – 21st July 2018.